On Tuesday afternoon I returned from snowy Atlanta to snowy New Jersey. While at the airport I was gathering thoughts on what the topic of my Post-#ASH17 blog should be. I didn’t want to repeat what others were saying. What could I write about that would be meaningful to my audience? I could highlight the sessions I attended, but Jack Aiello and I attended the same sessions and his recaps are amazing. Why spend time repeating information? Michael Tuohy addressed some of the quality of life presentations that I found note-worthy in his recent blog post. There went that idea. What could I write about that other members of the Social Media Team wouldn’t cover? 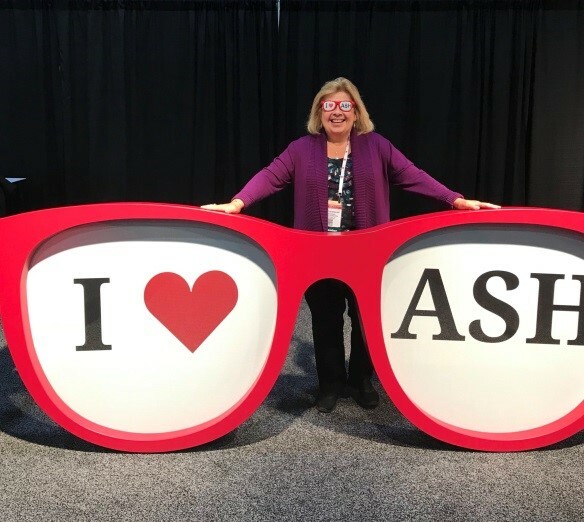 Cindy Chmielewski can’t hold back her enthusiasm and love for #ASH17. While I was deep in thought at Gate D21 at the Atlanta airport a woman approached me. She inquired if I was MyelomaTeacher on Twitter. When I responded I was she said, “Thank you.” This woman explained that she traveled from Zurich to cover the conference for a medical education company and that many of the meeting sessions that she desired to attend happened simultaneously. The choice of which presentation to join was always difficult for her to make. She said she knew if she missed a myeloma meeting she could review my tweets and feel like she virtually attended that session. This made her job easier. I then had an “aha” moment. I could blog about the Power of Twitter at #ASH17. Twitter can enhance the medical conference experience for those present and for those who are attending virtually. Medical conferences register a conference hashtag prior to the start of the meeting so participants can easily follow conversations that are happening at the gathering. The American Society of Hematology’s Annual Meeting hashtag is #ASH17. In addition to the conference hashtag, disease-specific hashtags helped narrow the conversations happening at #ASH17 from the entire field of hematology to a specific area of interest. The multiple myeloma hashtag on Twitter is #MMSM standing for multiple myeloma social media. When both of those hashtags are used together in the search engine on Twitter, the results are conversations about myeloma that are happening at the ASH 2017 meeting. 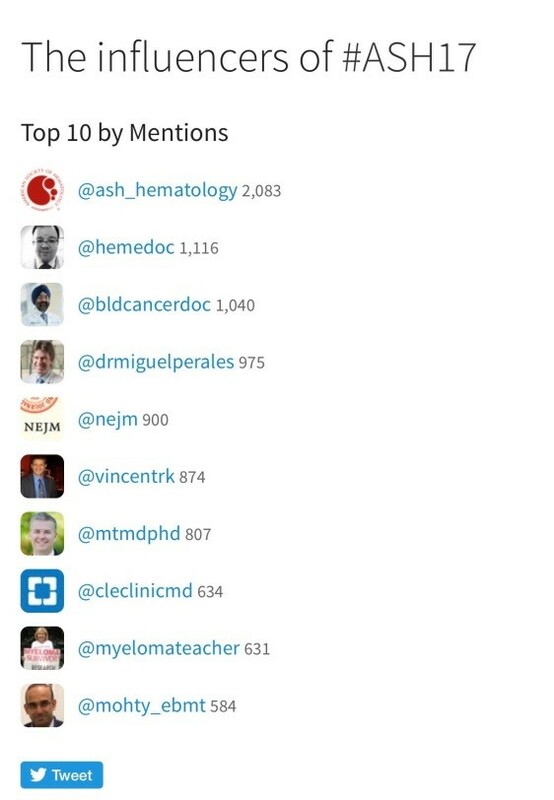 Symplur — a healthcare analytics company — ranks the top influencers on Twitter during #ASH17. Another useful tip is to follow curators of the #MMSM hashtag. At #ASH17 some of the myeloma influencers to follower on Twitter are myeloma experts @VincentRK ,@sagarlonialMD ,@mtmdphd , @szusmani , @BldCancerDoc, @drolalandgren , @Rfonsi1 , @transplant_doc @akeithstewart @myeloma_doc and @Mohty_EBMT. Additionally @imfnursemyeloma, @imfsupport , @NorthTxMSG, @imfmyeloma and @MyelomaTeacher provided informational tweets about myeloma. It is easier to make a list when you want to follow several people that way all the Tweets appear in one feed without distractors. Here is my #ASH17 list. Twitter allows everyone (not just medical professionals) from around the world to virtually “attend” any medical conference. “Everyone Included” isn’t that what we are aiming for? Virtually attendees have access to the real time information that is being presented at the meeting. They no longer need to wait for these same studies to be published in scientific journals months later. Journals to which patients usually don’t have open access. Virtually attendees can also actively contribute to the discussions and debates that are happening in real time at the meeting on Twitter. Patients can interact with doctors, researchers, foundations, and pharmaceutical companies. Their voice can be heard even if they are thousands of miles away sipping coffee in their PJ’s. Twitter is the great equalizer. All stakeholders have an equal voice at the same table. Twitter amplifies the educational reach of the professional meeting. Additionally, virtual attendees learn about promising clinical trials that are being presented during both oral and poster sessions by following hash-tagged tweets. Many of these tweets will include a picture of the slides being shown during the oral presentations or the poster being shared in the poster hall. Patients and doctors can further explore these treatment options. This may increase accrual to these promising trials. Less than 5% of adult patients who are eligible for clinical trials choose to enroll. Using social media networks such as Twitter to help increase accrual may help with this statistic. The International Myeloma Foundation’s (IMF) Social Media Team lovingly refer to me as “Tweety Bird”, but I don’t mind. Twitter is a powerful tool. I use Twitter to gather information, educate others, network with like-minded individuals and advocate for causes near and dear to my heart. I am glad that the IMF saw the value of social media at ASH several years ago. The IMF has sent patients to report on ASH using various forms of Social Media from the patient perspective when social media was in its infancy. If you haven’t had a chance to explore what Twitter has to offer you I suggest you set up an account and start searching the hashtags.